La du du is a vibrant restaurant offering a wide choice of authentic Vietnamese dishes. Do you work at La du du? What did you think of La du du? 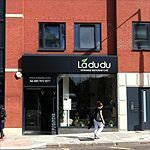 One of the most comfortable and friendly restaurants in West Hampstead, La du du serves delicious, freshly-made Vietnamese food. The décor is attractive and modern, with large windows to allow plenty of light in, and comfy sofas and low tables on one side of the dining area to give a coffee-shop feel to the place. The restaurant gets quite busy in the evening and you might need to wait if you haven't booked. However, you now can do just that thanks to owner Teresa having put in place a very up-to-date website and booking/online ordering system which can match those of bigger restaurant chains (her previous employment in IT no doubt helped). La du du has a winning point in its ambience. The lounge area is perfect for a catch up with friends after-work, whereas the dining area is ideal for an informal yet cosy midweek meal. Service is attentive, waiters are eager to refill your teapot and clear empty plates even though they never rush diners through their meal. The menu sticks to traditional Vietnamese fare. Starters range from £5 to nearly £8, with one of the highlights - the fried squid - hardly cheap at £7.50 but worth every penny thanks to some pretty masterful cooking. The spring onions and fresh chilli on the side work well. The deep-fried Vietnamese spring rolls are also very enticing; made of minced pork meat and prawns, you can have them on their own as a starter or as a main with noodles and vegetables. Other highlight mains include a dish comprising one pan-fried pork chop, fried egg and crispy pork skin (£9.95). If you are looking for something a bit healthier, traditional Vietnamese soup (Pho) boasts an aromatic yet delicate broth, served with your choice of meat or vegetables (around £9). Although all of the dishes ooze freshness, La du du's best is probably its delicious (and slightly addictive) homemade ice cream, which comes in exotic flavours such as lychee, or the deliciously sweet Vietnamese coffee. Ladudu does offer a selection of wines, although Vietnamese beers and loose leaf-teas are probably the best match for the spicier dishes. The cocktail list offers an exotic twist to classics, with the Lychee Mojito and the Orange and Ginger Martini particular highlights. Fragrant flavours and fresh produce are what make this restaurant worth a try, but La du du is also an ideal spot to catch up with friends over a traditional Vietnamese coffee - or those signature ice creams.